Repaints are mixed bag, in my opinion. The end result is either a figure that clearly surpasses the original or one that makes you question why the repaint was necessary in the first place. 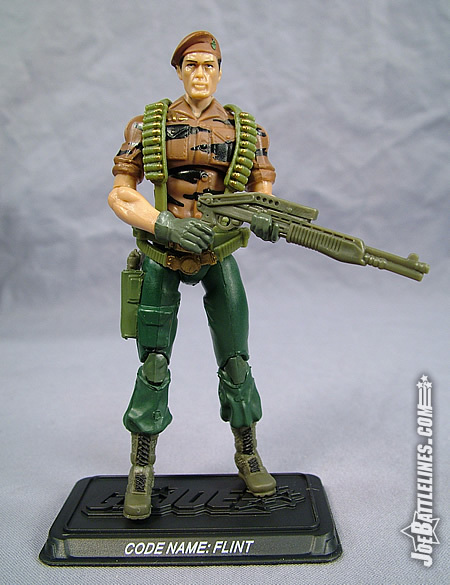 Since the relaunch of 3.75” GIJoe back in 2000, Hasbro has a history of releasing repainted versions of previously released figures every few waves. This trend, however, didn’t begin in 2000 and instead dates back to the days of the classic ARAH era. 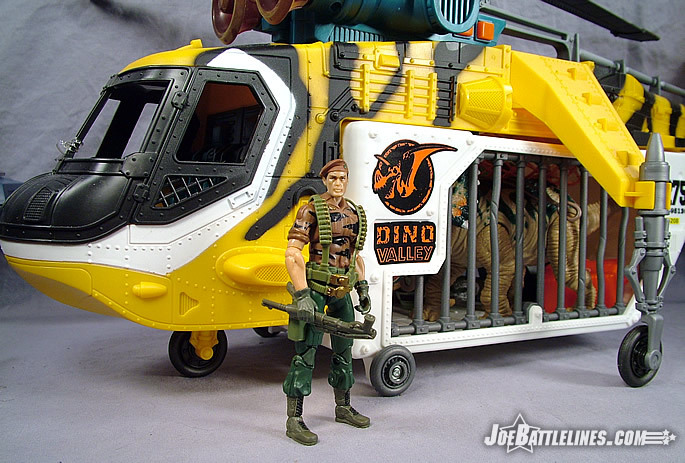 In 1988 Hasbro experimented with the notion of creating sub-teams within the GIJoe roster. Consisting entirely of repainted figures, these specialized units were usually tied together both logistically and visually by a common theme—with varying degrees of success. The Night Force was designed for low light operations and has long since been a fan favorite sub-team. 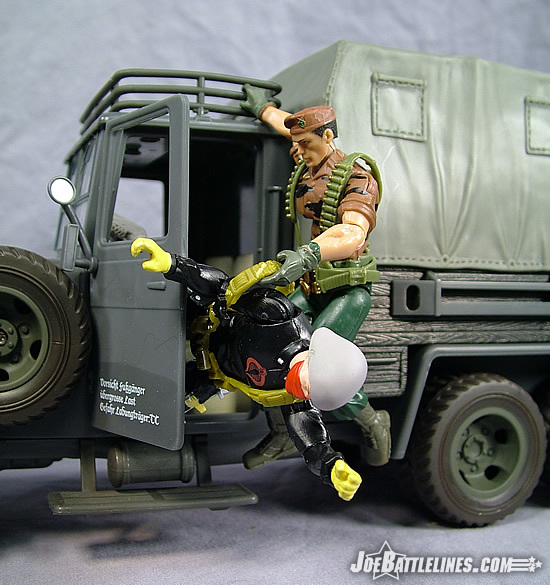 The Tiger Force, however, met with mixed results as many of the characters sported color schemes seemingly at odds with their stated specialization of jungle combat. In keeping with the theme of repaints in the 25A style, the design team in Pawtucket decided to revisit the Tiger Force by releasing an updated version of the team’s leader—Flint. As with most of the figures found in this wave, most of Flint has seen release before—back in 2007 wave 1. 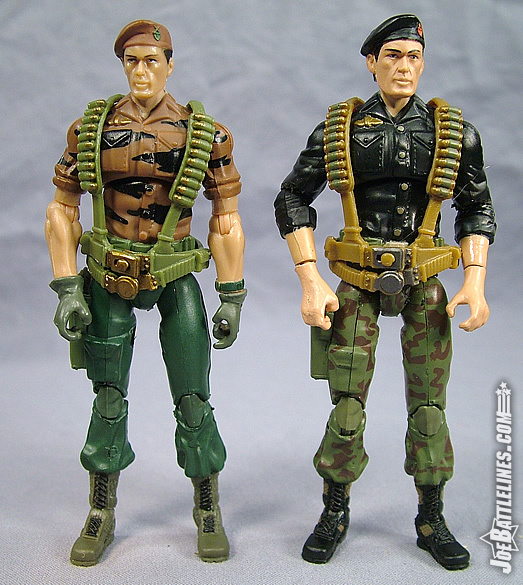 For the Tiger Force version, Hasbro elected to use the torso, legs, and head to recreate the jungle operation commander in a different color scheme. Flint’s olive camouflage pants are now more of a hunter green and his shirt and beret are now a brownish hue adorned with black “tiger striping”. The figure’s web harness has been rendered in an olive drab as have the figure’s boots. It’s a color scheme that is fairly faithful to the original release of the figure back in 1988, with only a few slight alterations. This time around the laces of the figure’s boots have been painted black and the small insignia on the beret has been given a darker paint application to help it stand out a bit more. 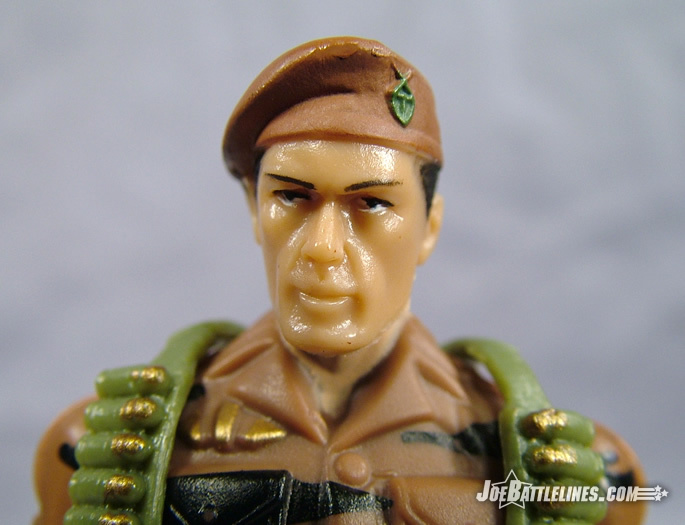 However, aside from these small “tweaks”, Hasbro really has done a pretty solid job of updated the character design of the original Tiger Force Flint. One detail that is noticeably different from the previous release of Flint in the 25A style is that this time the figure’s head has been molded in a flesh toned plastic rather than simply possessing painted skin tones. Frankly, I prefer molded faces to painted faces and so I find this a very welcome improvement over the earlier single carded version. I stated earlier that Hasbro used MOST of the previously-released Flint (and technically Duke) body to produce this version of Flint. However, one key element has been replaced and ultimately improved upon. Until recently, the term “Duke arms” has been uttered with the repugnance as one might announce an engagement to Rosie O’Donnell. 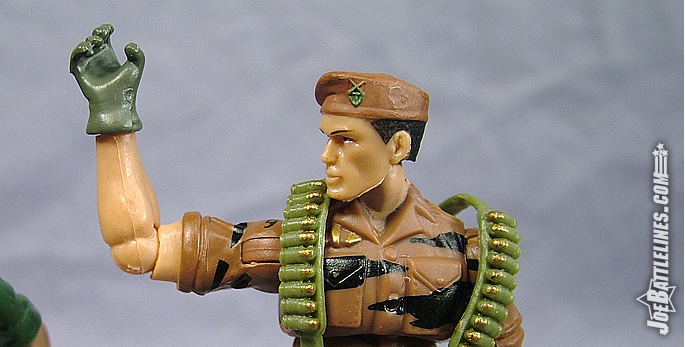 Ill-designed and poorly executed, the appendages were synonymous with terms like “t-crotch” and “action features” in the minds of many long-time 3.75” GIJoe collectors. It would seem that the design team at Hasbro has taken heed of the consistent flow of vitriol directed at the limbs and their design flaw. Unlike the first version of 25A Flint, this Tiger Force version has brand new functional arms—complete with rolled sleeves and gloves! 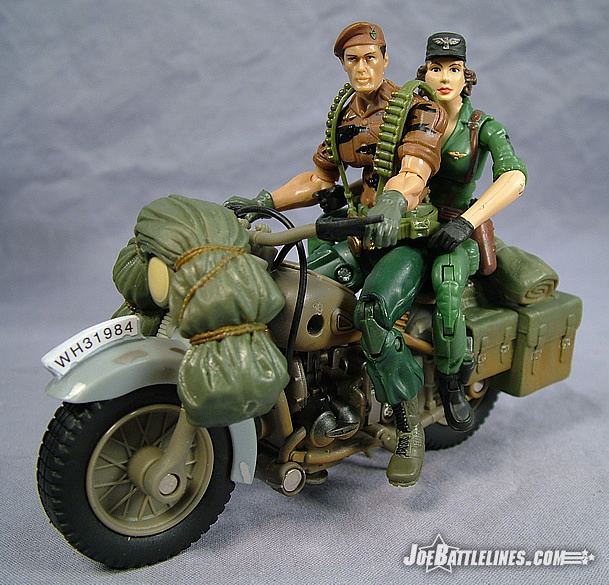 It would also seem that Flint has been working out in an attempt to further woo Lady Jaye as Flint has developed some seriously muscular forearms. Not only this, but the hideously obvious forearm joints have been moved to the seam at the top of the sculpted gloves! Honestly, the only way I could be happier with these arms is if they were released on a brand new updated version of the classic Flint design. (Somehow I think that Hasbro will see fit to release Flint again—whether in comic pack or battle pack format with the improved arms on the black shirt uniform.) It’s good to have tangible evidence that Hasbro has taken note of the feedback received on the dreaded “Duke arms” and this particular Joe fan can only hope that the day they fade into obscurity isn’t too far distant. Color me impressed with this most desperately needed improvement to a key character in this line. So Justin, am I obsessing too much about the arms of a small plastic man or are these just that much better? No obsessing at all, a simple change of arms has made this figure a LOT better than the one we originally got. I was not on the rampage as many people were when the first Flint was released, simply because I didn’t think the length of sleeves really mattered that much in the big picture. Of course there are so many other functional issues with those blasted Duke arms that they end up having a negative impact on every figure they’re used with, the original Flint included. But even though I wasn’t all that ticked off about the Duke arms originally, these new arms make a WORLD of difference. The sculpting, the range of motion, the articulation joints…it is all changed for the better, and I couldn’t be happier. 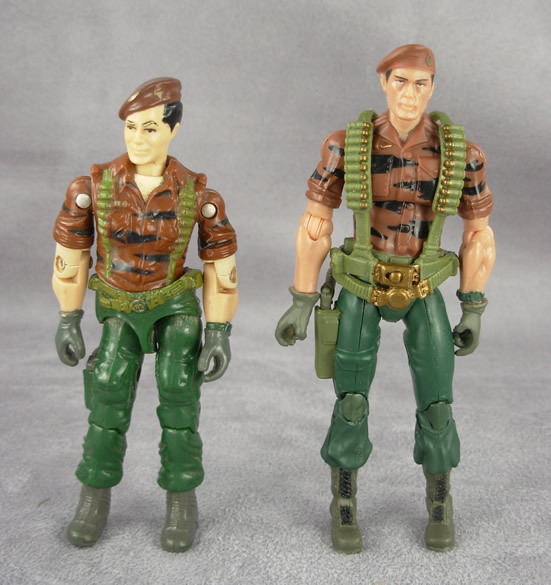 Like I mentioned in the review of the Python Patrol COBRA Officer, I’m not a big fan of the Tiger Force/Python Patrol sub teams…though Flint is a pretty happy exception. I don’t mind the Tiger Force Flint that much, because he manages to maintain a pretty subdued, logical color scheme (rather than obnoxious oranges, yellows, etc… that other Tiger Force members get saddled with). But still, I would have preferred a more standard Flint. As Fred said, though, there’s no question in my mind that we’ll get one down the line, possibly in one of the cartoon “ Battle Packs” coming up. Hopefully we’ll get the lowdown at the Joe Convention in a month! It’s time for the wrap up. Tiger Force color scheme = okay. New Flint arms = GOOD! 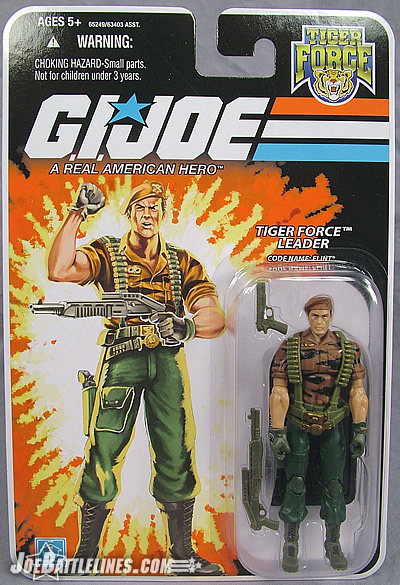 I’ve stated before—I’m not a fan of the Tiger Force color schemes and I initially only purchased this figure with the intention of reviewing him. However, as much as I find the color scheme a bit ill-suited to Flint, I’m as pleased as Justin in a room full of free Headhunter Stormtrooper figures with the improvements made to the figure’s arms. The rolled sleeves and gloves just suit the character far better than the original “Duke arms” ever did. Not only that but the new arms can achieve that crucial “90 degree” range of motion that has been conspicuously absent from so many of the 25A figures’ arms. So, while I’m not crazy about the colors, I can’t find too much fault with the improvements to the design. While not all fans of the 25A line are going to want to run out and snag this figure, I’d encourage the “ Flint curious” to give it consideration as the new arms really do make a world of difference. I agree on pretty much every point here. Not a huge fan of Tiger Force, I am a huge fan of Flint, and the new parts are fantastic. This Flint seems to roll in the same vein as the other figures in this assortment, where it’s okay…a nice change, some good improvements, but not necessarily a must have. I am absolutely thrilled about the changes to the arms, and I am really looking forward to seeing a more familiar standard vintage Flint looking like this. Now if only we could get Hasbro to use these awesome arms on the upcoming Comic Pack Falcon figure!